Not to be confused with Jordan Zimmerman. Jordan M. Zimmermann (born May 23, 1986) is an American professional baseball pitcher for the Detroit Tigers of Major League Baseball (MLB). He previously played for the Washington Nationals. Zimmermann is a two-time MLB All-Star, and co-led the National League in wins in 2013. In 2014, Zimmermann pitched the first no-hitter in Washington Nationals history. Zimmermann was born in Auburndale, Wisconsin, where he played all four years of high school on the varsity team at Auburndale High School. He began his career as a catcher, then moved to multiple positions due to his versatility. He was used as a starting pitcher as well as a closer in tight games. Zimmermann attended the University of Wisconsin-Stevens Point, and was drafted by the Washington Nationals in the second round of the 2007 Major League Baseball Draft. 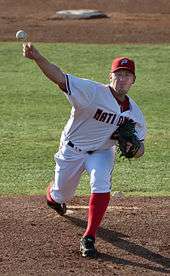 In 2008, Zimmermann had a combined 10–3 record with a 2.89 earned run average (ERA) with the Potomac Nationals of the Class A-Advanced Carolina League and the Harrisburg Senators of the Class AA Eastern League, and in July was named to the Eastern League All-Star team. He finished the season leading the organization in wins, strikeouts, and earned run average, and was the MILB.com Nationals pitcher of the year. Zimmermann was rated the Nationals' best prospect going into the 2009 MLB season, according to Baseball America. 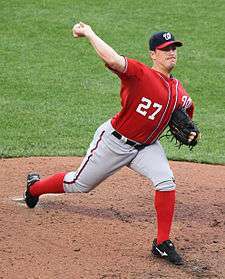 In 2009, Zimmermann made the Nationals' roster as the fifth starter; however, the Nationals did not need him in the rotation until mid-April, so Zimmermann opened the season with the Triple-A Syracuse Chiefs. Zimmermann's contract was purchased on April 20, 2009, and he made his major league debut that night, after a two-plus hour rain delay, against the Atlanta Braves. He pitched six innings, allowing two runs on six hits, with three strikeouts and a walk, earning the victory. In his second game against the New York Mets, Zimmermann won his second game in as many starts becoming the first Nationals/Expos pitcher to win his first two starts of his career since Randy Johnson did so in 1988. Coincidentally, Zimmermann was the losing pitcher in Johnson's historic 300th win on June 4, 2009. Zimmermann experienced elbow pain, and in July landed on the disabled list. After attempted rehab, in August 2009 Zimmermann was diagnosed with a torn ulnar collateral ligament and underwent Tommy John surgery, expecting to miss 18 months. He finished his rookie season of 2009 going 3–5 with a 4.63 ERA in 16 starts. In 2010 he made quick progress. Over four minor league levels, he started 10 games in limited play, racking up just 39.2 innings, but compiling a solid record: 1.59 ERA, 27 hits allowed, 31 strikeouts, and just six walks. On August 26 he was recalled to make his 2010 debut back in the big leagues, where Zimmermann got a no-decision in an eventual win by the Nationals over the Cardinals. On this same day, the Nationals learned that their other young pitching phenom, Stephen Strasburg, would need Tommy John surgery and would be out for 12–18 months. In Zimmermann's second return start, however, five days later, he pitched six shutout innings, allowing only one hit, no walks, and striking out nine, a personal best. He also became the first National to get through six innings facing only 18 batters. Zimmermann finished the 2010 year 1–2 with a 4.94 ERA in seven starts. On May 6, 2011, Zimmermann pitched an immaculate inning versus the Florida Marlins at Sun Life Stadium. He finished the 2011 year 8–11 with a 3.18 ERA. On May 28, 2012, Zimmermann hit his first career home run off of Miami Marlins pitcher Carlos Zambrano. Zimmermann became the third Nationals pitcher named NL Pitcher of the Month during the 2012 season when the selection was announced on August 2, 2012. During July he went 4–0 with a MLB-best 0.97 ERA. He gave up 27 hits in 37 innings and struck out 31 compared to 4 walks. He finished the 2012 season 12–8 with a 2.94 ERA. In Game 4 of the 2012 National League Division Series, Zimmermann made a relief appearance in the 7th inning, his first since 2008 at A-level Potomac. Entering a tie game, Zimmermann struck out the side. The Nationals would eventually lose the series to the St. Louis Cardinals after Game 5. Zimmermann hurled his first career shutout on April 26, 2013, with a one-hitter against the Cincinnati Reds. It was the second straight one-hitter by Nationals pitching in the series, marking the first occasion since 1917 that a Washington team achieved that streak, and the first time since 1900 that the Reds were victimized that way. In 2013, Zimmermann was named to his first All-Star Game, but chose not to play due to stiffness in his neck. He finished the season with a career high in wins, going 19–9, while also posting a 3.25 ERA over 32 starts. On September 28, 2014, the last day of the regular season, Zimmermann threw the first no-hitter in Washington Nationals history, a 1–0 win over the Miami Marlins and Henderson Alvarez, the pitcher who threw the final no-hitter of the 2013 season. Zimmermann faced only one over the minimum in the game; only a fifth inning walk to Justin Bour and a seventh inning third strike wild pitch that allowed Garrett Jones (who was subsequently picked off) to reach first base separated him from a perfect game. This was also the first time in MLB history that a no-hitter had been thrown on the final day in two consecutive seasons. He finished the season with a 14–5 record and a 2.66 ERA. Zimmermann finished the 2015 season with a record of 13–10 along with a 3.66 ERA, 1.205 WHIP and 164 strikeouts in 201 2⁄3 innings pitched. Following the season, he became one of a record 20 players to receive a qualifying offer. On November 30, 2015, the Detroit Tigers signed Zimmermann to a five-year, $110 million contract. Zimmermann was named the American League Pitcher of the Month for April. During the month of April, Zimmermann allowed just two earned runs in 33 innings pitched, for a 0.55 ERA. He was 5–0, becoming the sixth pitcher to finish April with five-plus wins, zero losses and a sub-1.00 ERA. He joins Fernando Valenzuela (1981), Randy Johnson (2000), Cliff Lee (2008), Zack Greinke (2009), and Ubaldo Jiménez (2010). Zimmermann's 0.55 ERA is the third-best mark for April in Tigers history. The only two Detroit pitchers with better ERAs in April were Bernie Boland with a 0.30 ERA in 1915 and John Hiller with a 0.36 ERA in 1974. On July 4, he was placed on the 15-day disabled list due to a neck strain. Zimmermann is mainly a three-pitch pitcher. He throws a four-seam fastball at 94 miles per hour (151 km/h) that tops out at 98 miles per hour (158 km/h), a slider which he describes as a "baby cutter" (86 miles per hour (138 km/h)), and a curveball (77 miles per hour (124 km/h)). On rare occasions, he also features a circle change to left-handed hitters. ↑ "2008 Season in Review - MiLB.com News - The Official Site of Minor League Baseball". MiLB.com. Retrieved November 29, 2015. ↑ "BaseballAmerica.com: Prospects: Rankings: Organization Top 10 Prospects: Washington Nationals: Top 10 Prospects". baseballamerica.com. January 6, 2009. Retrieved November 29, 2015. ↑ "Nats' Zimmermann goes 6 strong en route to win in MLB debut". ESPN.com. Retrieved November 29, 2015. ↑ "Who's the 'mann? Nats run over Mets". Washington Nationals. Retrieved November 29, 2015. ↑ "Zimmermann a hard-luck loser to history". Washington Nationals. Retrieved November 29, 2015. 1 2 Boswell, Tom (August 10, 2009). "Zimmermann Will Miss 18 Months". Nationals Journal. The Washington Post. Retrieved August 26, 2010. ↑ Carlson, Ted (August 26, 2010). "Daily Dose: Closer Confusion". Retrieved August 26, 2010. ↑ Kilgore, Adam (September 1, 2010). "Jordan Zimmermann dazzles, but Washington Nationals lose to Florida Marlins, 1-0 in 10 innings". The Washington Post. Retrieved September 1, 2010. ↑ "Zimmermann hits Marlins with immaculate inning". Sun-Sentinel. May 6, 2011. Retrieved May 11, 2011. ↑ Casella, Paul (August 2, 2012). "Zimmermann named NL's best pitcher of the month". MLB.com. Retrieved August 3, 2012. ↑ Kilgore, Adam (October 11, 2012). "Jordan Zimmermann wants to pitch in relief again on Game 5 after dominant inning in Game 4". The Washington Post. Retrieved October 12, 2012. ↑ Wagner, James (April 26, 2013). "Jordan Zimmermann and Nationals one-hit Reds for second night in a row". The Washington Post. Retrieved April 27, 2013. ↑ Jon Tayler. "Nationals' Jordan Zimmermann throws no-hitter against Marlins". SI.com. Retrieved November 29, 2015. ↑ Steinberg, Dan (September 28, 2014). "Audio: Jordan Zimmermann finishes off no-hitter". The Washington Post. Retrieved September 28, 2014. ↑ "Nationals make qualifying offers to Zimmermann, Desmond". foxsports.com. November 6, 2015. Retrieved November 29, 2015. ↑ Beck, Jason (November 30, 2015). "Tigers ink Zimmermann to five-year deal". MLB.com. Retrieved November 30, 2015. ↑ Bollinger, Rhett; Hall, Biran (April 30, 2016). "J-Up's homer keeps Zimmermann undefeated". MLB.com. Retrieved April 30, 2016. ↑ Beck, Jason (May 2, 2016). "Zimmermann claims AL pitcher prize for April". MLB.com. Retrieved May 2, 2016. ↑ "Zimmermann placed on 15-day DL with neck strain". ESPN. Retrieved July 4, 2016. ↑ Laurila, David (June 13, 2012). "Q&A: Jordan Zimmermann & Gio Gonzalez". Fangraphs. Retrieved August 3, 2012. ↑ "PITCHf/x Player Card: Jordan Zimmermann". BrooksBaseball.net. Retrieved May 9, 2012. Wikimedia Commons has media related to Jordan Zimmermann.